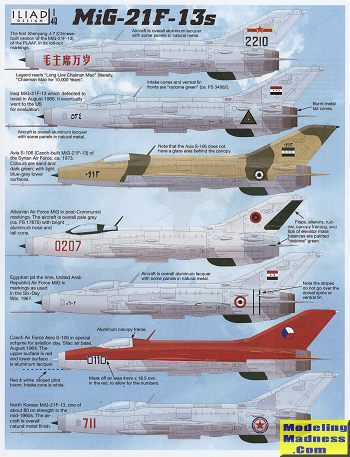 This latest sheet is for the MiG-21F-13. It is pretty much the basic interceptor version that carried a single cannon and a pair of missiles. Similar to other interceptors, time to climb was considered the main factor and so the type had very limited endurance, even with a centerline fuel tank. Regardless, it was a very popular export and was even reverse engineered by the Chinese as the Shenyang J-7, in which guise it was greatly improved over the years and still serves with other air forces today. This sheet provides markings for seven aircraft, most of them in unpainted metal. For kits, most will head for the Trumpeter version, though in this scale, there are others. First up is the initial Shenyang J-7 in its roll-out markings. Next is an Iraqi version from 1966. Its pilot defected to Israel and the airplane ended up in the US. Third is a Czech built S-106 of the Syrian Air Force in 1973. It is painted in sand/dark green uppers with light blue-grey undersides. The Albanian plane is in overall pale grey with 'radome green' flight control surfaces and canopy. An Egypian aircraft as used in the 1967 war is the next options. A Czech display aircraft from 1964 is the next to last. This has red upper surfaces with the canopy frame in unpainted metal. Finally, a North Korean aircraft that was on charge in the mid 1960s. 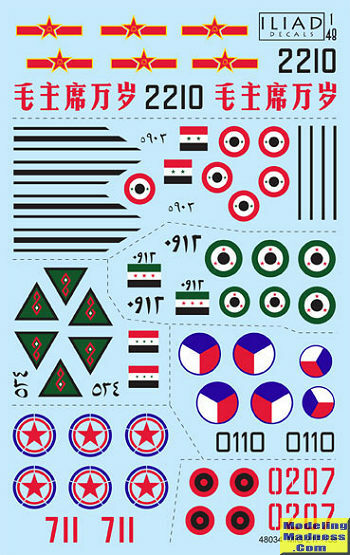 The decals are superbly printed and you can build every plane on the sheet with what is provided. Instructions show upper surface colors and insignia placement.